California Gov. 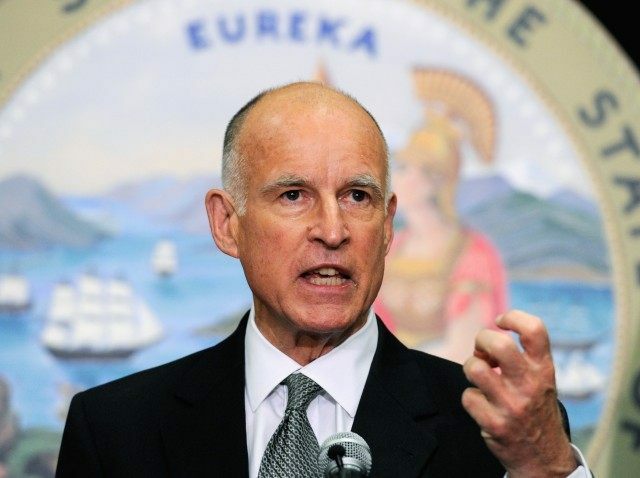 Jerry Brown struck an optimistic tone on the state’s record drought Tuesday night, saying technology and a “more elegant” way of living would ensure the state could beat its water shortage problems. Speaking at a California Conversation forum at the University of Southern California with Los Angeles Times and San Diego Union-Tribune chief executive Austin Beutner, Brown said the state could accommodate as many as 10 million more people in the coming years, provided residents adapt to a new way of life. In April, Brown ordered the State Water Resources Control Board to devise a plan to cut statewide water use by 25 percent this year. But the broad conservation plan has faced both practical and legal challenges. Californians cut water use by 13.9 percent in April, a significant improvement over the disappointing cutbacks in February and March, but still a long way away from the state’s 25 percent target. Meanwhile, last week, the city of Riverside sued the state over its conservation plan. Riverside, ordered to reduce water use by 24 percent under the state plan, argues that it should only have to cut use by 4 percent because it holds an abundance of groundwater in the Bunker Hill Basin. In April, the Fourth District Court of Appeals found that the city of San Juan Capistrano’s tiered water rates, on which the state plan heavily relies, violated voter-approved Proposition 218, which stipulates that a government agency may not charge more for a service than it costs to provide it. The state plan does not apply to agricultural interests, but California farmers with senior water rights offered to give up 25% of their available allotment this year in exchange for no future cuts, an offer that state water regulators accepted. Still, Brown was asked at the forum about agriculture’s exemption from the statewide plan. Specifically, Beutner asked why alfalfa grown with California water is being exported to China. Earlier Tuesday, Brown addressed the Metropolitan Water District board of directors meeting in downtown Los Angeles, praising the agency for its $450 million program that will provide rebates to residents who replace lawns with drought-resistant turf and to those who ditch old, water-intensive appliances like dishwashers with more energy and water-efficient models. “This is the first time in human history that we’re all in this together,” Brown said, according to the Los Angeles Daily News.